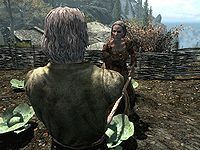 Boti is a Nord farmer who lives at Fellstar Farm in Ivarstead, together with her husband Jofthor and daughter Fastred. She and her husband keep a close eye on Fastred, being with her nearly all day. Arguments frequently arise in the family concerning Fastred's future, in which Boti tries to persuade her husband to give Fastred the freedom she wants. During The Book of Love, she will help you unite her daughter with Bassianus Axius. 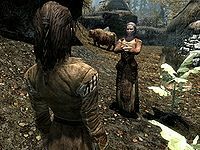 She holds a certain disdain towards the nearby Greybeards, apparent when she greets you with: "And to think that we've been supplying the Greybeards with our own food supplies. What have they ever done for us?" She wears a set of farm clothes and a pair of boots, and has a belted tunic for sleepwear (though she won't wear it). She is equipped with an iron dagger, and carries a key to the farmhouse, as well as a selection of common loot and gold. She and the family wake up early at 6am in the morning to have breakfast for an hour. They will go out to work at the farm for a good 8 hours, when she can be found raking the ground or picking the harvest. She'll go back inside with her family to have an early dinner at 3pm. An hour later, she'll spend the next 7 hours watching over the house, which is when she may take the opportunity to eat or take a nap. At 11pm, she rejoins her family at the farm for a quick check before heading to bed at 12am. 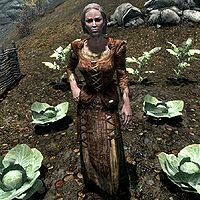 At any time of the day (unless you're trespassing), she will buy all cabbages, leeks, potatoes and/or wheat you've gathered. When you start a conversation with her, she'll remark: "You must be another pilgrim on the way up to High Hrothgar. No other reason to pass through here." She seems slightly hostile towards you, as she may utter the following as you approach her or talk to her: "You better not be here to stir up any trouble. ", or "Pilgrim or not, if I were you, I'd move right through our backwards little town." You can ask her whether she can tell you anything about High Hrothgar, to which she'll admit: "It's frightening living below their monastery. Sometimes I swear I can hear strange noises rolling down from up there. It sounds like thunder, but there's never any rain. What do you make of that?" When you leave the conversation, she'll proclaim: "Sure, leave. Everyone else does." "You have to let Fastred follow her heart." Boti: "You have to let Fastred follow her heart. You can't tell her what to do." Jofthor: "She's our only child, Boti. Am I to throw her to the wolves?" Boti: "You're hardly throwing her to the wolves. She just wants to see the world... just like I did when I was her age." Jofthor: "And if she decides to leave Ivarstead, what then? No, no... I can't bear the thought." "While you're under our roof, I need you to pitch in a little more." Boti: "I need you to pitch in a little more around here, dear." Fastred: "I help, I do the chores. What else would you have me do?" Boti: "I know your sights are set beyond this town, but for now, while you're under our roof, I need you to pitch in a little more." It is during The Book of Love, when you're sent to unite Fastred with her love, that you'll put an end to the drama. When Fastred asks you to speak to her mother, you can tell Boti about it: "Oh my. Probably something about the men. We all wish we had her problems. Now, don't tell my husband, but I don't have any problem with Bassianus. Even if it means her leaving Ivarstead, I want Fastred to be happy. If they just snuck out of town together, I could manage my husband." When you ask her what would convince them to leave Ivarstead, she'll admit: "Bassianus is still so terrified of Jofthor. If he knew that I'd keep him from hunting the poor boy down, he'd take Fastred to Riften without a second thought. Let him know that I'll watch out for them. I just want my daughter to be happy." Should you have told Bassianus to take Fastred to Riften, Boti may admit upon greeting you: "I hope Fastred's doing well in Riften. I miss her." During Hunt and Gather, Riften court wizard Wylandriah reveals she's good friends with Boti: "Last time I used the Dwemer Spoon was at my dear friend Boti's house in Ivarstead... Fellstar Farm I believe it's called."